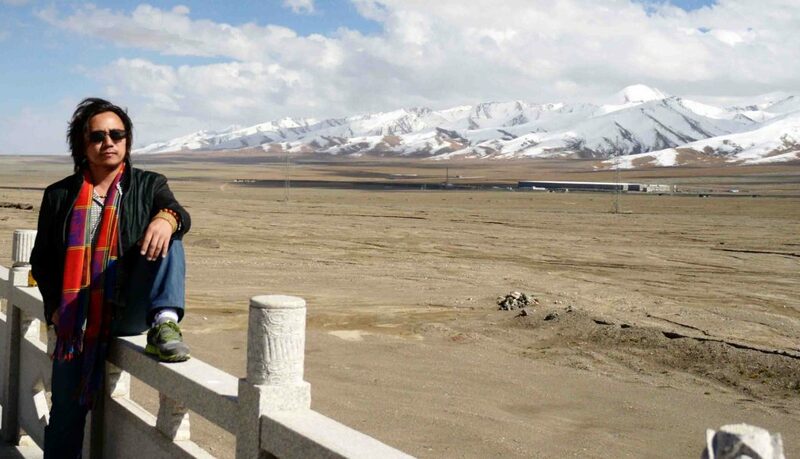 Zhang Yong (张勇), nickname Han Yu (翰宇), was born in 1977 at Tong Liao town (通辽市) in Inner Mongolia, China. Zhang Yong usually uses the art name of Da Yong (大勇) or Zhang Da Yong (张大勇). This means a man of great courage. He owns two art studios and they are name as the Drunken Heart Hall (醉心堂) and the Crystal Fate Pavilion (晶缘阁). 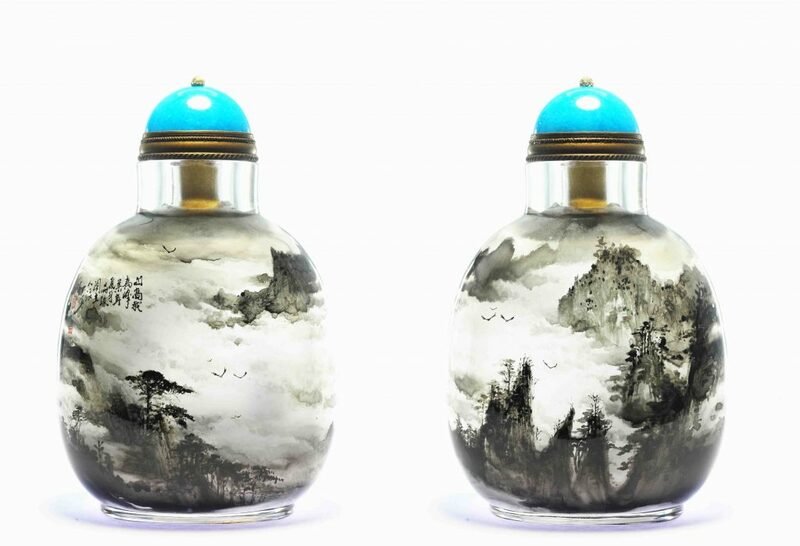 Both studios are located in Heng Sui, the capital city of the Chinese Inside Painted Snuff Bottle. Zhang Da Yong started his apprenticeship back in 1993 under the mentorship of two well-known master: Lee Guang Li (李广立) and Lu Jun Wei (卢俊为). With careful coaching from the two teachers and many years of tireless effort, DaYong is able to paint many subjects. Day ong like to paint landscape, figurine, calligraphy, portrait, animals etc with various style and perspective. His paintings are usually simple yet elegant with a pinch of his native Mongolian wilderness incorporated into his works of art. Da Yong’s creativity also allows him to paint on many type of natural hard stones bottles including banded agate, rutilated crystal, smoky crystal. Da Yong likes to transform the natural cracks and inclusion in the hard stones made them as part of his painting. His finished work is the combination of the artistic creativity of man and the beauty of nature. 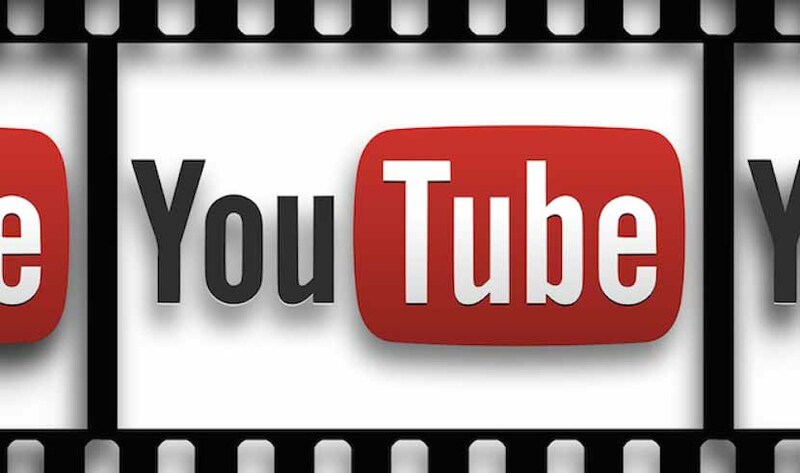 Zhang Da Yong has already earn himself a long list of accolade and achievements even as a relatively young artist. 2003 - Awarded the title of He Bei Chinese Art Master (Inner Painting Section) by the He Bei Province Art & Cultural Society, He Bei Master of Art Association. His work won the 2nd prize (Youth Section) in the Annual National Art Competition. 2006 - Zhang Da Yong’s work, <<The Crescent Moon>>, was awarded the excellent medallion in the Annual Heng Sui Yi Style Inner Painting Award and Competition. In the same year, Zhang Yong is given the title of Heng Sui Yi Style Inner Painting Master by the governing Association of Inner Painting Artists in Heng Sui Provence. 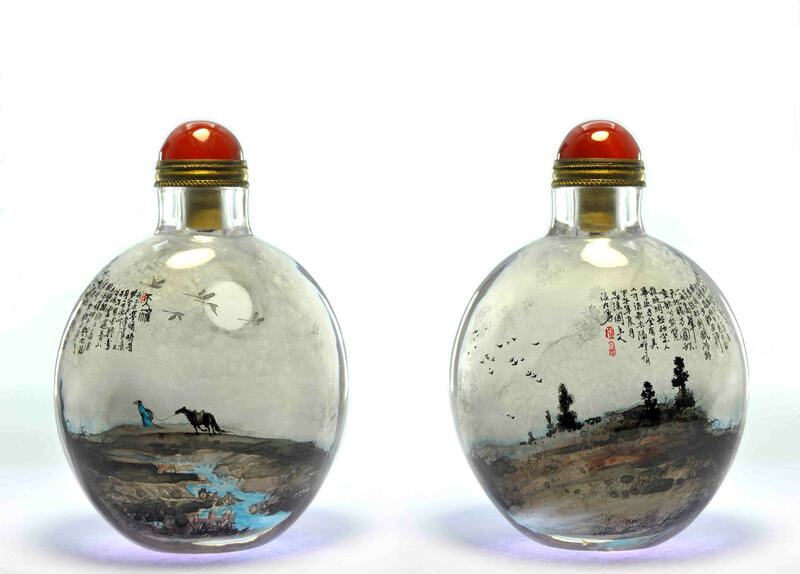 2010 - Zhang Da Yong’s work, <<Yue Fei>>, was awarded the First Class medallion in China, Shang Hai Snuff Bottle Art of Work Exhibition and Competition. 2011 - Zhang Da Yong’s work, <<By the River – A poem by Ming Dynasty Poet, Huang Shen>>, won the Art Treasure prize in the 4th Chinese Cultural Art and Treasure Exhibition and Competition. In the same year, his another master piece, <<Admiring the Moon>>, was awarded the Silver medal in the Chinese Natural Crystal Art and Treasure Exhibition and Competition. 2011 - Zhang Da Yong’s work, <<The Red River – A poem by Song Dynasty famous General Yue Fei>>, was awarded the Bronze Medal in the China Art & Craft competition. Another of this work, <<Zhu Ge Liang>> was awarded the Bronze Medal in the 13th International Chinese Art & Craft Master Exhibition. This piece also won him the Gold prize in the Chinese Antique, Art & Craft Exhibition and Competition under the Modern Inner Snuff Bottle Section in the same year. 2011-2012 - Multiple works from Zhang Da Yong are included as the exhibits in the Annual Chinese Art and Treasure Exhibition. 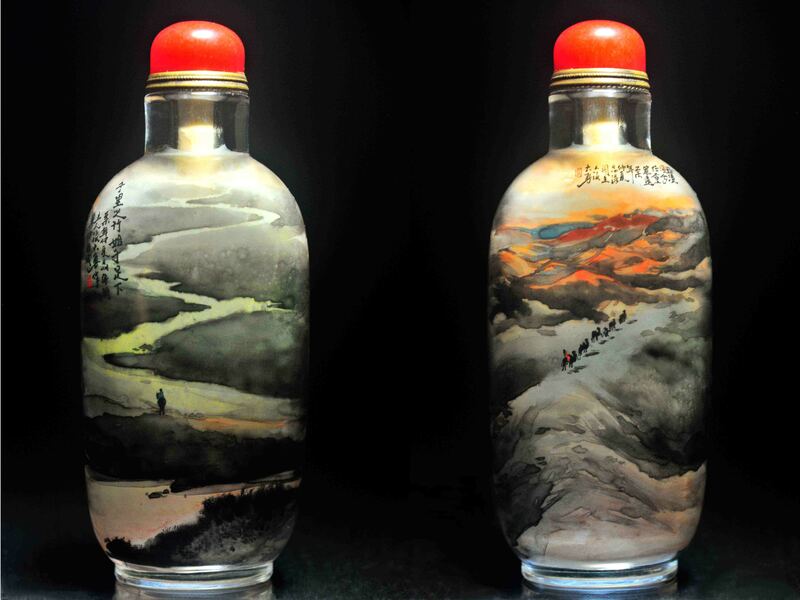 2013 - Bestowed the prestigious title of Heng Sui Master of Chinese Snuff Bottle Painting. 2015 - Awarded the Bronze Medal by the Chinese Art and Craft “Hundred Blossoms Award”. Da Yong’s works are included in many major inner painting snuff bottle books published by the Yi Style inner painting snuff bottle publications and other major art and craft book publishers. 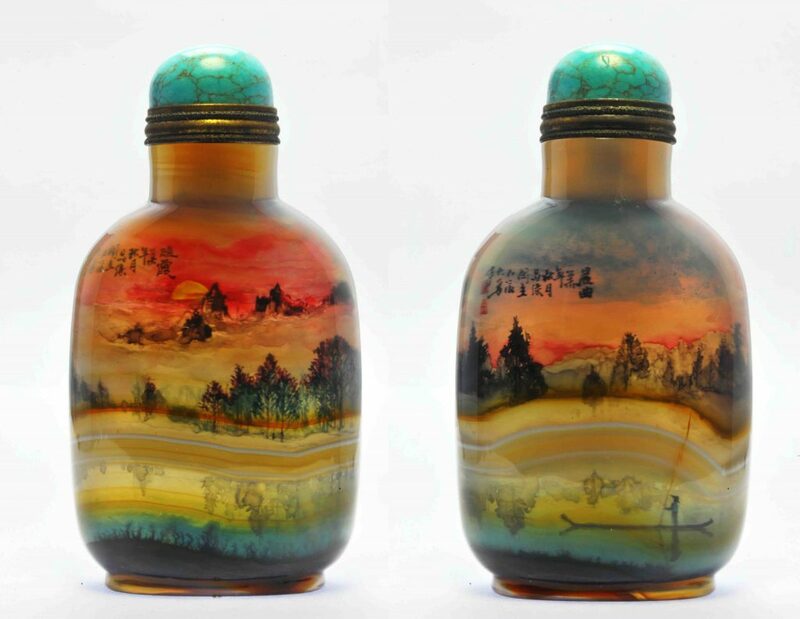 His works are also extensively collected by snuff bottle collectors in China, Hong Kong, USA, Europe and South East Asia. Currently, Zhang Da Yong is the Chairman of the Heng Sui Inner Painting Society. He is also actively participating as a member of many Association and Council like The Association of the He Bei Cultural and Artist Association, The Heng Sui Artist Association, The Chinese Painter Council and The Professional Chinese Snuff Bottle Association. 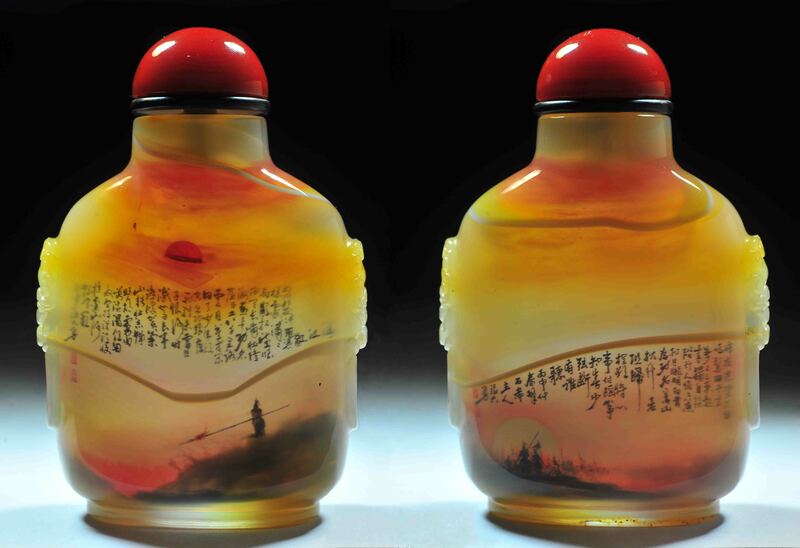 This beautifully shaped banded agate bottle was painted by Master Zhang Da Yong (張大勇)or Da Yong (大勇) and titled General Yue Fei. 岳飛, Yue Fei A.D.1103–1142 was a Han Chinese military general who lived during the Southern Song dynasty. He is best known for leading Southern Song forces in the wars in the 12th century between Southern Song and the Jurchen-ruled Jin dynasty in northern China before being put to death by the Southern Song government in 1142. Yue Fei was granted the posthumous name Wumu (武穆) by Emperor Xiaozong in 1169, and later granted the posthumous title King of È (鄂王) by Emperor Ningzong in 1211. Widely seen as a patriot and national folk hero in China, since his death Yue Fei has evolved into a standard epitome of loyalty in Chinese culture. 满江红 (River in red) is one of the most famous poems traditionally attributed to the general. When the imperial capital of Song was taken and sacked, its Emperor was shamefully abducted, its old heartland conquered by the Jurchens, General Yue Fei took up arms and waged a stubborn war of resistance and reclamation against the barbarians. This poem invoke the spirit of patriotic native resistance from the Song citizenry against the invaders and attempts to inspire them to retake the old homelands. The second poem is written around A.D. 1138 titled "XiaoZhong Mountain". 小重山 "Xiaozhong Mountain" is written during a sleepless nite in the Marshal’s tent. Yue Fei expressed his inner sorrow and frustration as he opposed a peace treaty with the Jurchen-ruled Jin Dynasty. He has won many major battles and is confident that the Han can reclaim back the land that is taken over by the Jin. However, Emperor Song Gaozong and Qin Hui was only interested to stay in power and favor a reconciliation with the Jin. To facilitate the peace treaty, The Song generals were not allowed to move any troops. "Xiaozhong Mountain" was written in this situation and climate. Yue Fei’s inner depression is extremely indignant and frustrated as well as helpless in the situation. "A journey of a thousand miles begins with a single step", (千里之行，始於足下), is a proverb written by the famous Chinese philosopher Lao Zi (老子), 604-531BC. Lao Zi is widely recognized as the founding father of Taoism and although his historical existence is still strongly debated, as is his authorship of the seminal Taoist work, Tao De Jing (道德经), his influences over the Chinese culture is as deep set as Confucianism. An interesting legend tell of a story that Lao Zi spend eighty years in his mother's womb and was born wise and with white hair. Lao Tzu often uses stories, paradox, experiences from ancient wisdom and analogy to expressing his ideology across. His writing are poetical and dense, at the same time rhythmic and catchy. In this quote, Lao Tzu is trying to say that all great things start from the very beginnings; the first humble step forward towards the final destination. So start today, start now, start off with the first crucial step toward the success that you have been dreaming of! Master Zhang Yong (张勇) or Da Yong (大勇) chose a tall and longish rock crystal bottle to bring across the idea of the journey ahead after the humble first step. This bottle illustrated Master Zhang Yong ability to maneuver multiple contrasting colors within the inner wall of a bottle to give the audience a perspective of deep and vastness of the landscape ahead. Truly one of the best masterpiece produce by him in 2015. I am the summit of the mountain on its peak, The sky is the shore of the ocean at its end. Since then, this famous verse or version of it, has very often been borrowed by Chinese entrepreneur and company to motivate and actuate their employees to look beyond their current limitation and help shape the future for themselves and the company; to scale the mountain and to become the summit at the mountain peak! The bottle is painted in classic monochrome and captured the essence of Chinese ink painting all within the walls of a small bottle. Master Zhang Yong uses detail layering technique to create a range of mountain that starts in the foreground and extend itself into the distance clouds, giving the audience a three dimensional feeling of the majestic landscape. This is a poem that descripted the poet’s dream that trace the fantasy of him and his best friend travelling to the sky and the moon with two others great poets of the pass; Li Bai (李白) and Su Shi (苏轼) . Together, they drink wine and sing on the moon, using the big dipper as a scope for their wine. In the second part of the poem. The poet descripted his sadness after waking up from the dream and when he think of the corrupted state of his beloved country. He also expresses how much he missed his friends that share the same aspiration as him. Master Zhang Yong (张勇) painted a vast, almost empty, landscape to express the loneliness of the poet after his career was cut short by his political enemies. Master Zhang also displayed his calligraphy skill when he write the whole poem onto the bulbous clear natural rock crystal bottle that he used for this piece. In this painting, Master Zhang Yong uses a banded agate bottle to separate the land and the lake; making use of the white creamy colored agate band as the sand bank of the lake. On one side of the bottle, titled “Morning Song”, Master Zhang Yong incorporated an almost vertical natural inclusion of the agate body as the pushing poll of a boatman when he gracefully guide his boat across the calm water surface at day break, singing a song that celebrate the beginning of a beautiful day. Master Zhang Yong then used a dense and saturated mixture of red, orange, yellow with a tint of purple coloration to paint the reverse side of the bottle, titled “colors at dusk” the expresses the magnificent beauty of the Tibetan highland at sunset. A truly amazing piece of art that fully expresses the creativity and mastery of a very talented inside painting artist at his best.